Wow! San Diego Comic Con is only 10 days away! This year is going to be a big one for me, as I have several projects out with IDW and Boom! Studios and we’ve just announced my first creator-owned book The Third Witch. Between now and the show, I’m sure I’ll be making a number of announcements and a few days before I’ll list my whole schedule including signings, but for now check out these cool panels I’ll be on throughout the show weekend. The final issue of Combiner Wars is huge. I’m joined by awesome artists Marcelo Ferreira and Corin Howell for the finale. The last two pages are going to blow your mind, so one small request: please if you are discussing this issue this week, use spoiler warnings, so that everyone can be surprised at the big reveals. 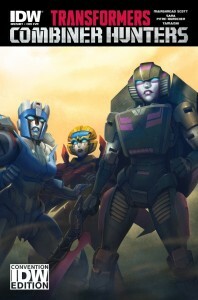 Also Hasbro just announced that at San Diego Comic Con there will be an exclusive Combiner Hunters toy set featuring Arcee, Chromia, and Windblade. 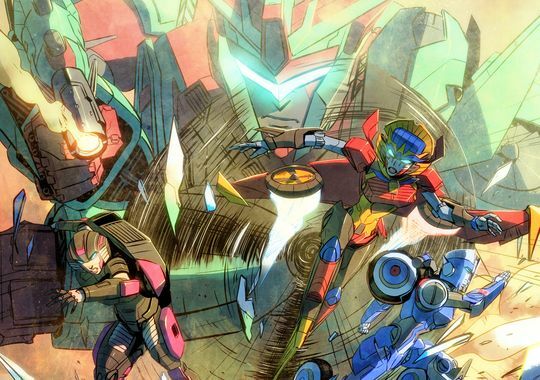 In addition there will be SDCC exclusive covers for Combiner Hunters #1, Windblade #4, Transformers #42, and More than Meets the Eye #42 all by Combiner Hunters artist Sara Pitre-Durocher. Sara’s art with Yamaishi’s colors on this book are absolutely beautiful and this book introduces Victorion, so don’t miss this issue! COMBINER WARS FALLOUT! Because you demanded it-WINDBLADE and CHROMIA team up with ARCEE to put an end to the menace of the COMBINER WARS-but will they end each other first?! 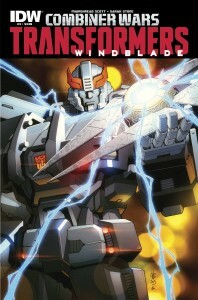 Featuring the first appearance of fan-created combiner Victorion! Even more big news coming later this week so stay tuned!